Some days can pass simply watching and waiting for your prey to make an appearance. Hours may be needed to study your prey before a successful shot can be taken. In short, blind hunting can be a waiting game. Why not just use a regular camping chair? Now, that does not mean that you should not play the game; nor does it mean that you should have Sky TV installed. It simply means that you may want a chair to sit on to save your restless back and knees. The Millennium G100 Blind Chair is a pretty viable option to allow a comfortable rest. After all, just because we are out of range does not mean we cannot be comfortable. 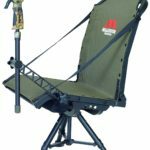 There are times when a regular camping chair will lack the comfort you need to make for a more enjoyable hunting experience. 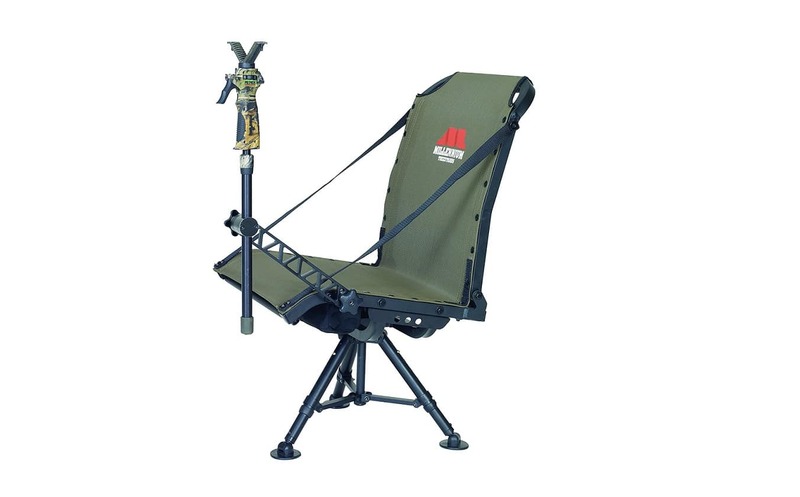 Even though they come at a lot lower price, (like this Coleman Camping Chair for example) they can also be bulky and often too large to fit into the shelter. A specially made blind hunting chair is your best bet, principally due to their compact size. We particularly love the high back on this chair. Previously, we had been experimenting with stools and concluded that they do not provide the same support. We are sure that the Millennium Treestand g100 blind has a special comfort technology built into the fabric. It was not only comfortable, but easy to set up, which is something we were hoping for. Another feature we really liked was the space available for you to attach the gun rest, which is always handy on long days. The G100 also has a shooting stick that is very to mount. You may also add a trigger stick. That way it is not only perfect for your hunting rifle but also a crossbow or firearm. Probably the top feature that this chair offers is the adjustable legs: they meant that we could sit on uneven ground with only a few minor adjustments. 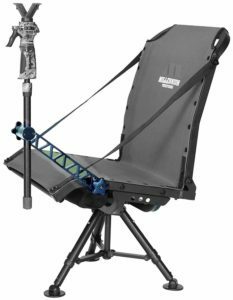 If your hunt includes setting up on a ridge or hill, then this is the blind hunting chair that you need in your life. It makes things that little bit easier when you finally arrive at you chosen spot. The Millennium G100 is only 7 pounds in weight, does not squeak, and takes approximately twenty five seconds to set up. Additionally, the chair makes no noise when it is being set up: which meant we did not scare any potential prey during our arrival. The creators really took everything into consideration when they designed this chair. The colour looks good in among the trees and does not stand out. In addition, it appears to be made of extremely durable materials. We discovered that this product includes a one year warranty, but we could not think of any way you could damage the chair, without deliberately doing so. Overall, we were really impressed with the design and loved the features of this chair. If we had a complaint, it would be that the makers do not offer sofas! We have definitely found a new favourite chair and cannot recommend it highly enough. It does exactly what it is described to do, while also offering style. If you are interested in knowing more about the best hunting chairs available, make sure to check out the latest price on Amazon and also this article on the best hunting chairs overall.